You’re beyond excited about your next accessible vacation, but the planning process is a little overwhelming… How should you go about planning your trip to Europe? Where to go, when to go, what to see, where to stay, how to get from A to B, what will it cost? If you try to take shortcuts, you’ll almost certainly encounter some frustration and disappointment on your trip, but if you do it right, you’ll have a great, hassle-free vacation, and it will be all worth it! 1. Decide which destination(s) you are interested in. I personally use the book “1000 Places to See Before You Die” and Rick Steve’s guidebooks to get some inspiration for my travel. 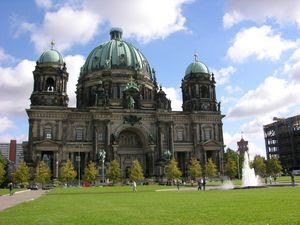 Another good place to start is our European Accessibility Rating’s page, where you can find a comparison of several European cities based on accessibility, quality of sights and “Worth the Effort” considerations. 2. Check price of flights at various dates. You’ll find that flights in the shoulder months (April, first half of May, September, and October) are often less than flights during the summer months. Most places in Europe still have good weather during these months, and they are usually less crowded. There are countless ways for you to search for flights online using search engines such as hotwire.com, kayak.com etc. 3. Research the accessibility of the tourist sites. It can take numerous hours to browse the internet, send emails and place calls. Accessibility research of the specific places you want to experience is an essential step in the process of planning an accessible vacation without any major disappointments. 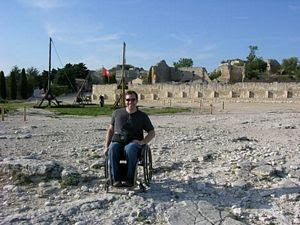 Visiting a city that is far less accessible than you expect – This happened to me in Les Baux, France. The medieval hill town had cobblestones in town and gravel in the fortress ruins. 4. Check the accessibility of transportation. Accessible buses are available in many European ports and cities, and some cities even have wheelchair accessible taxis and boats. The official Tourism websites for your desired destination(s) and our accessible transportation pages are good sources of information for accessible public transportation. 5. Find accessible, affordable hotels and research the location. In Europe, many hotels (particularly in the older tourist parts of town) are in 100+ year old buildings. The result is that truly accessible hotels can be difficult to find and generally more expensive. Don’t forget to research accessibility (hills, sidewalk ramps, accessible restaurants, etc…) and safety of the neighborhood surrounding the hotel. 4 star disabled hotel in central London with spacious accessible bathroom including roll in shower, grab bars, shower chair, wide doors and open space under the vanity. 6. Make a daily itinerary… It will help you figure out how many days it will take to see the sights, which days they are closed, how to group them, and in what order. Remember, your itinerary should fit the energy and activity level of your group. Some disabled travelers have no problem with a full schedule with tours and experiences every day, while others may need a break in between to rest. Book your accessible hotels. You can call or email the hotel directly or use a hotel search engine website. Either way, be aware that some accessible rooms might not have all the features you are looking for so make sure to ask before you book. Book your accessible tours. From my experience, the best tours and guides book fast so you’ll want to do this well in advance. Book your transfers. Whether you only need airport transfers, port transfers or also need to plan transportation between destinations, setting up your transfers before you get to your destination means that you won’t have to spend valuable vacation time handling logistics. 8. Purchase Travel Insurance. Protect your health, your financial investment and your vacation! Once you make your first arrangement for a trip, that date becomes the initial trip deposit date. Please note that if you have any pre-existing conditions, many travel insurance policies require you to purchase your plan within a specified number of days of making that initial trip deposit if the coverage is to be in effect. 9. Emergency contacts. Before you leave, arrange for someone inside and someone outside of your destination to assist in case of emergencies. 10. Re-confirm. Depending on how far in advance you are booking you’ll probably have to reconfirm your bookings a week or two in advance of your travel dates to make sure everything is set and ready for your arrival. To do a good job planning an accessible trip on your own will typically take 20- 40 hours per city. Save valuable time and money by booking all your accessible travel services in one place, with an accessible travel expert doing all the work for you! Check out our accessible full trip planning services today and contact us to start planning your next European vacation!